How much does it cost to travel to Cannes? How much money will you need in Cannes? €110 ($124) is the average daily price for traveling in Cannes. The average price of food for one day is €36 ($41). The average price of a hotel for a couple is €120 ($136). Additional pricing is in the table below. These average travel prices have been collected from other travelers to help you plan your own travel budget. While Cannes was once little more than a small fishing village, today it is a popular, glamorous seaside town frequented by celebrities. 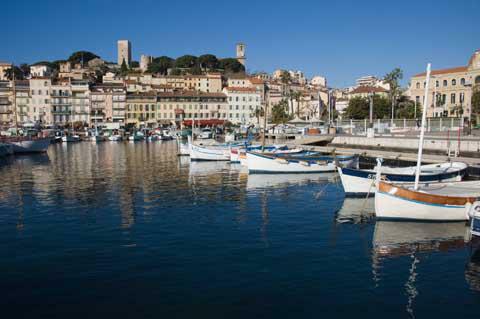 It's the place to see and be seen, particularly during the Cannes Film Festival in the month of May. During this time the city comes alive with celebrities from all over the world. While Cannes has its share of exclusive clubs, bars and restaurants, there are alternatives for budget travelers, so don't shy away. There's a beautiful area, Le Suquet, which is nice to visit with its cobblestone streets and stunning views. It's also fun to pass some time people watching by the marina. You never know who you'll spot. At night, the city comes to life with casinos and luxurious restaurants and clubs that give the area a vibe of exclusivity. Cannes has a Mediterranean climate with warm summers and mild winters. There is very little rainfall throughout the year and most of it occurs during the months of October and November. Summer weather can be expected between the months of June and September. This is also when the crowds are the busiest and the prices are the highest. During the winter months, temperatures may drop to below 10 degrees Celsius. Spring and fall are still warm and pleasant, and the city may be less crowded. Some of the top sights around town include the Old Town, with castle ruins, the Covered Market, which is a great place to grab a bite to eat, the port, where you can check out yachts that belong to the rich and famous, and the nearby beaches, most of which are private and will set you back about thirty euros for a single day's use. Iles de Lerins, the islands in the bay, are also worth a visit. The smaller, St Honorat, has a monastery and the ruins of a castle. The larger, Ste Marguerite, has a castle as well as restaurants and shops. Notable neighborhoods in Cannes include Boulevard de la Croisette, Centre Ville, Le Vieux Port, Le Suquet, La Californie, and Le Cannet. Boulevard de la Croisette is the city's most famous promenade. From it you'll see the city's beaches, the fanciest hotels, and many high end shops such as Hermes, Chanel and Lacroix. Centre Ville has a slightly more affordable shopping area, the train station, and some interesting restaurants. Le Vieux Port has old world charm as well as extreme wealth. Le Suquet is the old town, where you'll find impressive historic sites and great views of the sea below. La Californie was home to Picasso during the 1950s and Le Cannet is a suburb that has some interesting art and craft galleries. Part of the experience in Cannes is to people watch. From the yachts to the high end restaurants, there's no shortage of things to see. There are also cruises available to a variety of locations including Monaco, St Tropez, Ile Sainte Marguerite and more. These are a great way to see the area and have an experience on a luxury ship. Some cruise ships offer lunch or dinner tours that last just a few hours. Food in Cannes, although delicious, is often very expensive. Particularly by the riverfront area you will find expensive restaurants of variable quality. If you're looking for good food that is not unreasonably overpriced, head to the Rue Meynadier in the Le Suquet area. Here you can enjoy a meal outdoors overlooking the town without breaking the bank. Another option is to head to Rue de Antibes for a meal. In general, traditional French cuisine is very expensive, so Italian restaurants may offer a better deal. You will miss out on trying some interesting local specialties though. You can also purchase fresh, local produce at any of the markets and enjoy a meal of your own making at a very affordable price. Your best option for traveling around Cannes is to either walk or take a bus. There are taxis, which can be challenging to find, particularly during peak times. It's actually fun to walk as the weather is usually quite comfortable and this is the best way to soak up the city's atmosphere. There is a reliable bus system that has routes within the city as well as connections to the neighboring towns of La Bocca, Le Cannet and Mandelieu-La Napoule. Buses usually run every fifteen minutes.